3000 miles north & back: Roasted Asparagus. For Leah's pumpkin carving party this past weekend, she asked Matt and me to bring a side dish that was not salad or bread. I knew immediately that I would bring a vegetable and Matt said he wanted something green. This request definitely narrowed my options. A few veggies that went through my head = broccoli, green beans, zucchini and asparagus. I decided to bring asparagus...roasted asparagus. Roasted asparagus is one of my staple vegetables. It is so easy to cook and tastes so good. 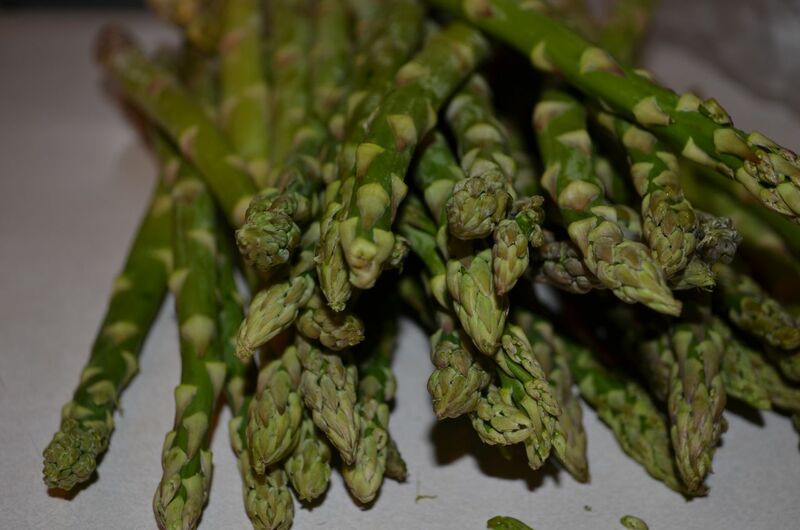 AND asparagus is low in calories and very rich in vitamins and minerals = VERY good for you. Always a bonus. 3. Crush garlic and combine with olive oil. Stir rapidly. 4. Arrange asparagus in single layer on baking sheet. 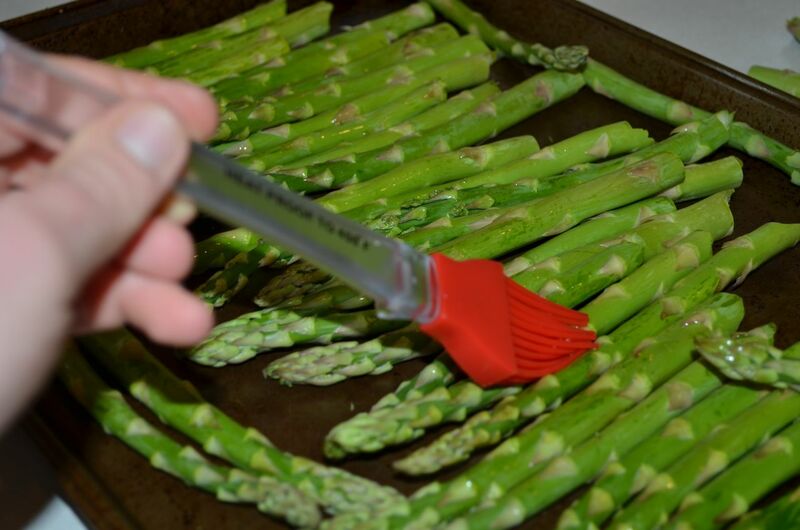 Brush asparagus with garlic/olive oil mixture. Sprinkle with parsley. 6. Roast asparagus 8-12 minutes, rotating and shifting the asparagus half-way after 5-6 minutes of cooking time has elapsed. 7. Remove asparagus from oven and serve immediately. I was so excited to see that the asparagus looked amazingly good in the produce section of the grocery store. Recently, the asparagus as looked spindly and malleable but these stalks looked firm, crisp and straight. The ends of the asparagus were closed and compact (which is a good indicator for fresh asparagus). 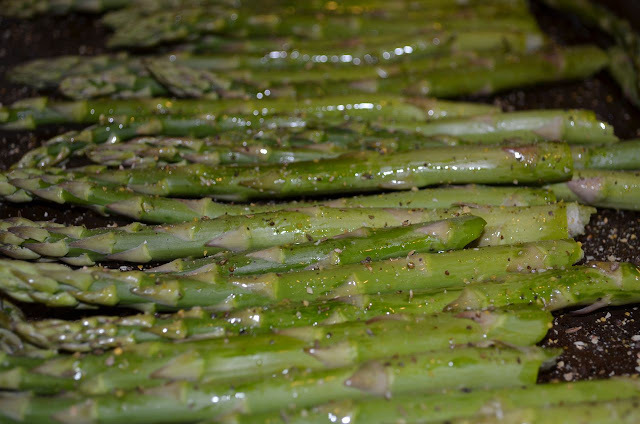 Laying the asparagus in a single layer on the baking sheet allows the asparagus to cook evenly. I think the garlic/olive oil mixture and parsley really adds a great flavor to the asparagus. I brushed the asparagus with the garlic and olive oil mixture; however, another way to coat the asparagus is by putting the asparagus with the garlic and olive oil in a plastic bag and shaking the bag until the asparagus is fully coated. I usually cook the asparagus for the minimum amount of time because I prefer my asparagus slightly crunchy. 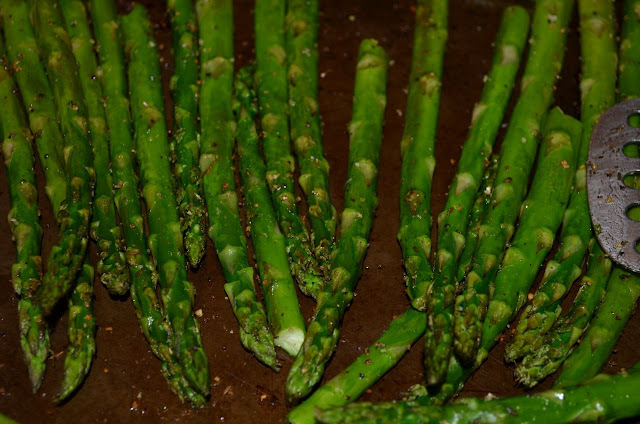 After you take the asparagus out of the oven, add additional seasonings as desired and place on serving plate. Asparagus is a great vegetable to serve with a multitude of dishes. 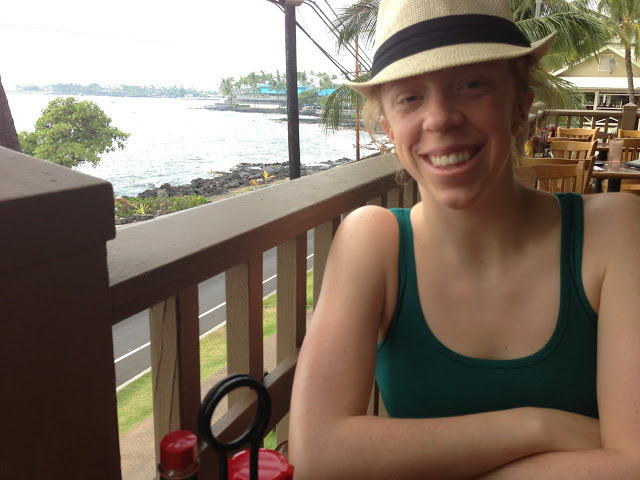 It tastes great with all kinds of meat and fish. Feel free to alter the seasonings depending on what you are serving with the asparagus. Other great spices that work well with asparagus are dill, oregano and lemon. I hope you enjoy this wonderful asparagus recipe.